Experience Box will organize an unforgettable experience for your group with rafts (inflatable boat) or kayaks. Several spots are available in the Málaga and Granada provinces (Antequera, Nerja, etc). White water rafting is an unforgettable adventure ideal for your next incentive or team building event. We will provide qualified instructors (F.E.P. certified), all necessary material (rafts, paddles, helmets, wetsuits, etc), insurance, etc. Optionally we will provide you with a DVD including all pictures and videos shot during this amazing experience that will last between 1.5h and 3h (depending on the spots and the season). Transport to/from the "rio" can be organized, as well as lunch on the way there, etc. 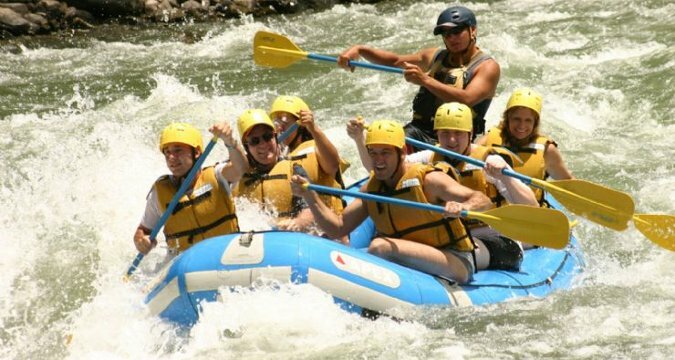 Rafting is a really convenient activity for any group looking for sports, fun and nature. We cater for groups of 10 to 100 participants. We provide wetsuits. Bring shoes that can get wet and changing clothes.